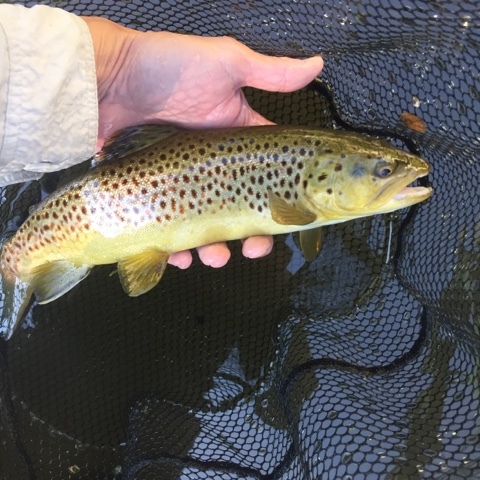 I took a vacation day from work and fished the Farmington Trico hatch and spinner fall in the morning. I thought it might be less busy during the work week. Nope. My favorite Trico spot was even busier. It was a fun outing, although the hatch wasn’t as robust as during last time’s 21-fish morning. Perhaps, it is because it became very cool overnight. Or, maybe it is a natural progression, as the hatch may be starting to wane. The fish were very selective. A floating Trico spinner was the ticket, and accounted for seven trout landed, three of which were good-sized. 13″ maybe? Pricked some others. Other Trico patterns were ignored. I’ve read that trout get more selective as the Trico hatch progresses. The Trico action ended at 10 am. I was hopeful that the X-Caddis would continue to produce. Nope. I cycled through a bunch of flies. Nothing. Then, a bunch of fish rose to a #24 olive parachute fly. I either missed most or they gave splashy refusals. 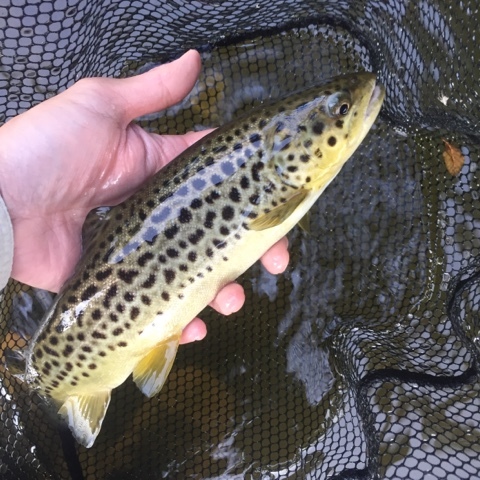 Landed two browns, however. Everything died at noon. So, I reeled up and left. Water was a solid 63 °F at dawn and 68 °F at noon. So, it is a good thing that the temps are getting cooler. I hope everyone is enjoying the final days of August.